Puressentiel Purifying air spray combines 41 essential oils among the most active ones to destroy germs, acarina, microscopic mushrooms, parasites, virus, bad smells. 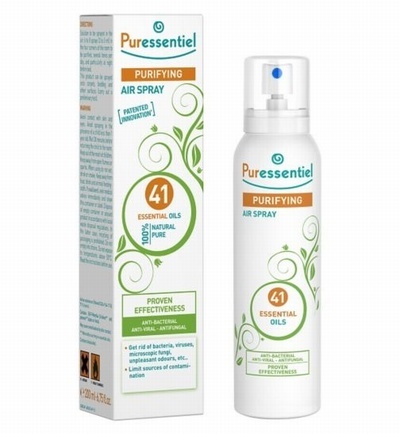 It is a 100% natural product that helps to sanitise air, release the breathing functions, limit sources of allergy, purify, cleanse, disinfect and deodorise ambient air of the house (adults, children's rooms, sick people, humid rooms, very low-ventilated rooms, WC, kitchen), polluted or smoked out atmosphere, bed linen or animals smell, offices, workshops, public places, cars. Dye-free, preservative free, free from synthesis fragrance, without propellent gas.